Noboru Takayama | Rainy Days from Kayne Griffin Corcoran on Vimeo. 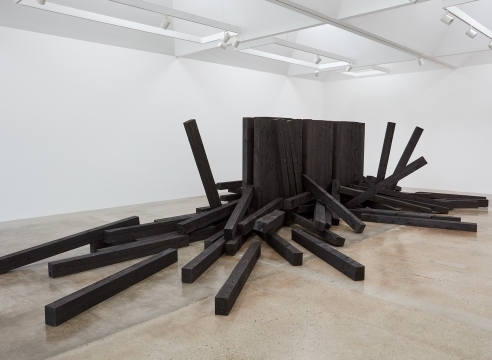 Noboru Takayama’s railroad tie-based installations form the core of his work. Continuing unwaveringly from the late 1960s to the present, this work is one of great density. The tirelessly productive Takayama has indeed become a vital presence in the art of today. Imbued with powerful originality, Takayama’s “railroad ties” capture in a potent manner his views on art, and have also become basic units in his pieces. Within each and every tie, Takayama sees the shadows of the countless people victimized by the world’s modernization, and paying his respects to them, he constructs spaces that are unique to each occasion. Then, the people of today, when present in these places, may go about changing, toward finding within themselves “places of truly living with regard to the world.” As we confront these spaces of Takayama, we may be able to experience compact, wholly engaged moments. Especially in today’s world, where our reality of living is threated by an ever-changing dilution, it would be behoove us to take in the spaces of Takayama’s works.